Beer Fellows: The day after MLK Jr. Day beer links! 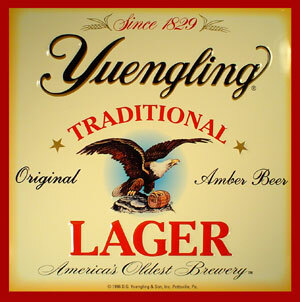 Congratulations Yuengling, it only took over 180 years! Sorry folks that I didn’t get these up yesterday, but let’s kick off the week with another edition of beer links. Yay for Yuengling! This is one of Brian’s favorite beers, for me it is always the right choice if it comes down to this or a macro. It’s biased of course, all lists are but I think many of these would be worth going to and tipping a pint. See where yours stack up. This one is for Sarah of Beer Meets Cheese. Seriously though there are times I really miss living in Madison. It’s the macros that are continuing to loss ground, craft brews are ascendant but not picking up the slack fast enough. It’s your weekly dose of beer crime. This time though it’s the keg itself that is valuable. For those of you keeping track at home that is $153,350.70 worth of beer kegs. Oh Mississippi, you need to get with the times. You would think a state that poor would be open to the possibilities of increased income by developing a welcome attitude to craft beer and breweries. The line that made me laugh was “an alcohol friendly culture.” Seriously?! That is 90% of most colleges in this country. Welcome to the Cambodian beer scene people, because that’s what we are about on this blog, world wide beer! I’m plugging this because I interviewed Mike Causey, owner and brewer for Broadcast Brewery, one of the two that will be making that factory their home. Look for it on Thursday and Friday. Was it beer, no, not how we would define it, but it certainly was a major foundation of what we drink today 5000 years later. I don't think this in any way undermines the impact of Sumerian beer culture on the world. Pint is one of those words in beer drinking culture that we toss around probably too casually. I know I’m guilty of it. Will the truth come out? We’ll just have to wait and see. It is good to see Canadians getting fired up about their beer. A bit of a late start this week, but we will make it up to you with Brian’s first review of a Saranac winter warmer. It’ll be on the site tomorrow. On Thursday and Friday check out our conversation with Mike Causey, owner and brewer for Broadcast Brewery, a new brewing venture getting established in Nashville. We skipped Welcome to Your Weekend this last weekend but it will be back this Saturday. As always you can find us on facebook or twitter. Subscribe to the Jolly Good Fellows Beercast on iTunes, and rate us if you like what you are hearing. We love comments, suggestions, and recommendations. Thanks for stopping by!